Knitting looms can be used to make a variety of knitted objects, from socks to scarves and hats. If you want to make a baby hat using a knitting loom, all you need to do is master one simple technique, and you can make a baby hat in an hour or so. Make one for your own baby or loom knit several for charity projects or local hospitals. To begin, you need to select a knitting loom that is small enough for this project. Looms come in various sizes for different types of projects; choose a small, infant-sized loom to make a baby hat. Choose yarn in a baby or worsted weight for this project. Leave a 3-inch tail of yarn and begin wrapping at your starter peg (it should be marked with some type of dot; if it isn't, mark one for yourself and always begin with that same peg). Wrap the yarn around each peg one time, in a counter-clockwise fashion. Move clockwise around the loom to continue wrapping, mimicking the shape of a cursive, lower-case letter "e" around each peg as you loop. Wrap the yarn around each peg a total of three times, then secure around the wrapping peg or use a thumb tack stuck into the side of the loom. 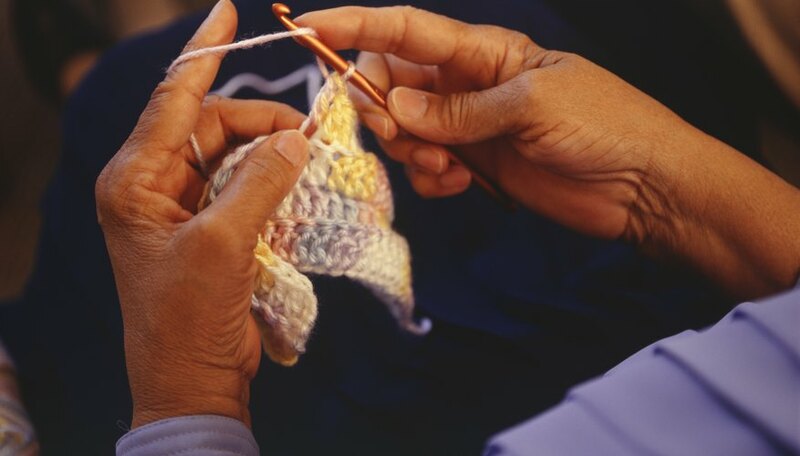 To make one knitted stitch on a knitting loom, use a loom hook or crochet hook and pull the bottom strand of yarn up and over the other two strands, moving from the outside edge of the loom and releasing the yarn once it is on the inside edge of the loom. Continue this all the way around, and when you get back to the last peg, wrap the loom again before repeating this process. Knit 12 to 15 rounds in this manner for the main body of the hat, stopping when it has reached the desired height. When your hat is ready to be finished, thread a yarn needle with a 15-foot length of yarn and double it up on the yarn needle. Thread this needle through every two-loop stitch left on the knitting loom, and pull the stitches off the loom. Pull the thread to tighten the stitches in a drawstring motion, and stitch a few stitches over the opening before tying a knot in the threading yarn to secure it. Add a pom pom or other hat embellishment, if desired.